We in the Issaquah School District take laboratory safety very seriously. 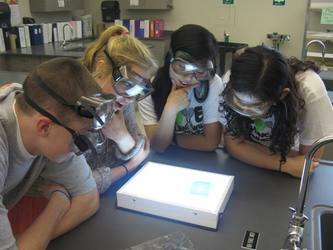 Safety in the science classroom and laboratory is the FIRST PRIORITY for students, instructors, and parents. To ensure safer classroom/laboratory/field experiences, the following Science Safety Rules have been developed for the protection and safety of all. This document is based off the National Science Teachers Association (NSTA) Science Safety Rules. Safety in the laboratory can be addressed from three points of view: student preparation before the lab, student execution during the lab, and teacher monitoring during the lab. 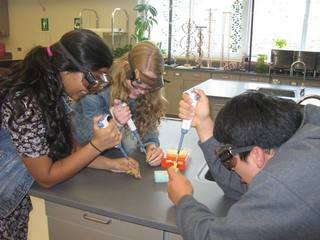 Students will be observed during the lab, but the preparation that the student does before the lab is even more important. Your teacher will provide additional rules for specific situations or settings. The Rules must be followed at all times. Each student must have returned the class expectations agreement, signed by student and parent before being allowed to do lab work. Your signature indicates that you have read these Rules, understand them, and agree to follow them at all times while working in the classroom/laboratory. ​NOTIFY YOUR INSTRUCTOR OF ANY ACCIDENT OR POTENTIALLY HAZARDOUS SITUATION. Conduct yourself in a responsible manner at all times. Frivolous activities, mischievous behavior, throwing items, and conducting pranks are prohibited. Lab and safety information and procedures must be read ahead of time. All verbal and written instructions shall be followed in carrying out the activity or investigation. Eating, drinking, gum chewing, applying cosmetics, manipulating contact lenses, and other unsafe activities are not permitted in the laboratory. Working in the laboratory without the instructor present is prohibited. Unauthorized activities or investigations are prohibited. Unsupervised work is not permitted. Entering preparation or chemical storage areas without instructor permission is prohibited at all times. Removing chemicals or equipment from the classroom or laboratory without instructor permission is prohibited. If you do not understand how or why to do a task, ask your instructor for help. If there is any doubt in your mind, ask your instructor. Sanitized indirectly vented chemical splash goggles or safety glasses as appropriate (meeting the ANSI Z87.1 standard) shall be worn during activities or demonstrations in the classroom or laboratory, including pre-laboratory work and clean-up, unless the instructor specifically states that the activity or demonstration does not require the use of eye protection. When an activity requires the use of laboratory aprons, the apron shall be appropriate to the size of the student and the hazard associated with the activity or investigation. The apron shall remain tied throughout the activity or investigation. All accidents, chemical spills, and injuries must be reported immediately to the instructor, no matter how trivial they may seem at the time. Follow your instructor’s directions for immediate treatment. Dress appropriately for laboratory work by protecting your body with clothing and shoes. This means that you should use hair ties to tie back long hair and tuck into the collar. Do not wear loose or baggy clothing or dangling jewelry on laboratory days. Acrylic nails are also a safety hazard near heat sources and should not be used. 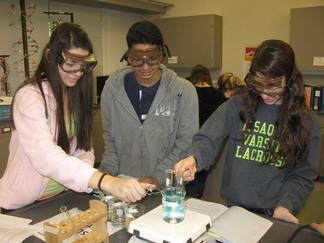 Sandals or open-toed shoes are not to be worn during any lab activities. Refer to pre-lab instructions. If in doubt, ask! Know the location of all safety equipment in the room. This includes eye wash stations, the deluge/safety shower, fire extinguishers, the fume hood, and the safety blanket. Know the location of emergency master electric and gas shut offs and exits. Know how to USE all safety equipment in the room. Know the location of the Emergency Evacuation Route map and how to read the map. Wash your hands with soap and water after handling any chemicals, glassware or touching any surface in the lab area before leaving the lab area. When an activity or investigation requires the use of laboratory gloves for hand protection, the gloves shall be appropriate for the hazard and worn throughout the activity. If you have a medical condition (e.g., allergies, pregnancy, etc. ), check with your physician before working in lab. Avoid inhaling in fumes that may be generated during an activity or investigation. Never fill pipettes by mouth suction. Always use the suction bulbs or pumps. Do not force glass tubing into rubber stoppers. Use glycerin as a lubricant and hold the tubing with a towel as you ease the glass into the stopper. Proper procedures provided by the instructor shall be followed when using any heating or flame producing device especially gas burners. Never leave a flame unattended. Remember that hot glass looks the same as cold glass. After heating, glass remains hot for a very long time. Determine if an object is hot by placing your hand close to the object but do not touch it. Should a fire drill, lockdown, or other emergency occur during an investigation or activity, make sure you turn off all gas burners and electrical equipment. During an evacuation emergency, exit the room as directed. During a lockdown, move out of the line of sight from doors and windows if possible or as directed. Always read bottle labels twice before you use the chemical. Be certain the chemical you use is the correct one. Replace the top on any chemical bottle as soon as you have finished using it and return the bottle to the designated location (even if there are others behind you). Do not return unused chemicals to the original container. Follow the instructor’s directions for the storage or disposal of these materials. All chemicals should be regarded as hazardous unless your instructor informs you otherwise. Never mix or heat chemicals unless you are directed to do so. When mixing concentrated acids and water, always pour acids into water slowly and stir constantly. When observing the odor of any liquid, do not smell it directly. Use your hand to fan the odor towards you. Never taste a chemical or a solution or touch chemicals with your hands unless directed to do so by your instructor. When heating a test tube, do not heat just one spot on the test tube. Never have the open end of the test tube pointed at anyone. Never look directly down into a test tube. Backpacks and books are to remain in an area designated by the instructor and shall not be brought into the laboratory area. Never sit on laboratory tables. Work areas should be kept clean and neat at all times. Work surfaces are to be cleaned at the end of each laboratory or activity. Work deliberately and with definite purpose, but do not hurry. Know what you are doing. Be wary of what neighboring students are doing. Solid chemicals, metals, matches, filter papers, broken glass, and other materials designated by the instructor are to be deposited in the proper waste containers, not in the sink. Follow your instructor’s directions for disposal of waste. If you are unsure, ask the INSTRUCTOR. Do not overfill waste containers. If new waste container is needed, tell/ask the instructor. Sinks are to be used for the disposal of water and those solutions designated by the instructor. Other solutions must be placed in the designated waste disposal containers. NEVER JUST POUR SOLUTIONS DOWN THE DRAIN. Ask if you are unsure!! Glassware is to be washed with hot, soapy water and scrubbed with the appropriate type and sized brush, rinsed, dried, and returned to its original location. Goggles are to be worn during the activity or investigation, clean up, and through hand washing. Appropriate clothing is required on lab days. Students will be required to wear long pants, closed-toe shoes, and a shirt fully covering their shoulders and torso. The idea is to limit skin exposure to direct chemical spills or splashes. Long hair must be tied back and dangling jewelry or scarves should not be worn. NOTIFY YOUR INSTRUCTOR OF ANY ACCIDENT OR POTENTIALLY HAZARDOUS SITUATION IMMEDIATELY. IF ANY CHEMICAL IS SPLASHED ON YOU SKIN OR IN YOUR EYES NOTIFY YOUR INSTRUCTOR as you FLOOD the area with LARGE amounts water IMMEDIATELY. Your instructor will tell you when to stop washing. the science laboratory and/or disciplinary action.